Fasten your shoe laces. Its time to discover efficient Treadmills Workouts to burn fat. Sample 20 minute, 30 minute routines for quick weight loss results. Beginners, advanced and sports Interval Training. Treadmills are safe, easy to use and extremely convenient and no doubt every gym has a pile of them. Exercising on a treadmill is a very efficient cardio workout to burn calories, do cross training aerobic workouts or simply do Interval Training Treadmill Workouts. No worry weather. Adverse conditions can be a tricky exercise buster. Treadmills are great for indoor cardio training. The treadmill platform is cushioned and easy on your legs. Even competitive athletes are using treadmills for workouts as they offer a better and more controlled workout. And by changing levels or going incline treadmills offer you cardio workouts of widely varying levels. You can Walk, Jog or run on a treadmill. You can use treadmill as a cross training activity when you get bored of outdoor running or using other aerobic exercise equipments. There are two types available - the manual one where you use your legs to get started and manually increase/decrease the resistance and the Electric ones where motorized computerized treadmills set the pace for you. If you want to buy one here are some treadmill buying tips. Always use good running shoes before you ride a treadmill. Running shoes is not an area to save a few bucks! Before you start a treadmill workout do a 3-5 minute stretching routine for your back, hamstrings and calves. In case you are new to treadmill workout, you can ask the support staff at your gym or the fitness store where you intend to purchase to show you the demo. You can then straddle your feet and start the running belt if you use an electric one. Start walking on the manual one and the treadmill gets started. Start at a slow and steady pace before you hit your training zone. Initially you may have to hold the railings but later as your balance improves you can swing your arms and burn additional calories. Once you train for 20-30 minutes at your target heart rate zone, you should lower the speed and only then step out of the treadmill. You can literally play with your treadmill routine. You can add speed for 5 minutes then reduce it for the next 5 minutes. Its called Interval Training. Even with Interval Training you should be able to pass the Talk Test. That is you should be able to talk in short sentences without going out of breath. Otherwise you hit the anaerobic zone and burn sugar instead of fat calories. Alternate between 2 minute walk and 5 minute Jog for 30 minutes total. Alternate between 30s walk and 5 minute jog for 30 minutes. Quadriceps, Hamstrings, Gluteus, Gastrocnemius and shoulder and arm muscles when you swing you arms. Also your Abs and Lower Back muscles help you stabilize your body. Most treadmills come with a safety clip which attaches to your shirt. In case of a fall the treadmill stops automatically. No. A calorie burned on a treadmill is still a calorie burned, the same as walking or running or using other exercise equipments. Conclusion - Treadmills are effective for cardio and endurance training, easy to use and add a great variety of workout routines. All you need is a good set of running shoes and off you go! The treadmill is one of the greatest additions in the exercise world. This is because many people skip exercises because they don’t have the time to go to the gym or take classes from a coach. The treadmill can be used to get a total cardio and effective body work out. It can be a good companion for losing weight, and also for strengthening the muscles of the body. Good cardio exercise can also develop the bones, keeping people away from the danger of easy fractures later on in life and also making it easy for them to get healed quicker in case they have an injury. Treadmills can be placed in the home and they are most interesting because they can be used to do a variety of exercises while talking with your spouse, following sports on TV or watching your favorite movie. Many people just go on the treadmill and just jog, run or walk and then come back down after a certain period without taking note of how far they have walked, for how long, how intensively they ran or how many calories they burnt. Therefore it is not easy to track their progress, and though they will be getting some exercise from their work out which will be essentially good, they might not be working efficiently. Following a treadmill work out program is like having your own personal coach. You follow each routine daily, forcing you to concentrate on your workout, challenge yourself and also improve in the level of exercise. Below is a four week treadmill work out program that you can use for total body work out. Walking is good exercise and wakes you up. Starting with a walk gives your muscles time to wake up, gets the blood pumping faster and keeps you prepared for heavy exercise later on. Start with a light walking for about 2 to 3 minutes, increase to a jog for about 5 minutes. Slow down back to a jog, then to a walk and come to a halt. You will increase your heart rate, and then bring it slowly down while taking deep breaths. Start with a light walk for about 2 to 3 minutes of warm up, go to a jog, for about 2 to 3 minutes, then an intense run for about a minute or two and then go to a jog, then a walk and then halt. Then go to a jog for about 3 minutes, incline the machine for increased difficulty and continue jogging for some time, then go to a short run, bring yourself slowly to a halt by slowing down to a jog, then a walk then halt. Repeat until you complete at least a 30 minute training period. Then go to a jog for about 3 minutes, incline the machine for increased difficulty and continue jogging for some time, then go to a short run, bring yourself slowly to a halt by slowing down to a jog, then a walk then halt. Repeat until you complete at least a 30 to 45 minute training period. Do light exercise, walking, light jogging, and then back to walking so you are in form. Include all the things you learnt in the past weeks in this session. Start with a walk to warm up for about 3 to 5 minutes, gradually increasing to a jog, then a run for about 3 minutes. Bring yourself down to a halt by going back to a jog, then finally slowing to a walk. Do the next round by going for a jog, then incline the ramp, run for a about 5 minutes, then bring it down, slow down to a jog then walk. Repeat for about 45 minutes to an hour with 2 to 3 minutes break in between. During the breaks, don’t stop abruptly, keep walking slowly on the machine while you breathe deeply to recover, then repeat the session again. Same as Monday, but increase the time of running on the incline for more power development and more cardio work out. Warm up with a short walk, slowly go to a jog, do this for about 10 to 15 minutes. Rest by slowing down to a walk to catch your breather and repeat. Here you are winding down the exercise week, but you don’t have to just stop and rest. The exercise should be moderate to low intensity. This is just to release the tension in the muscles and enable you relax for the day of rest. Treadmill Reviews & Buying Guide - Ratings and reviews of popular treadmill brands. 1. What's a good workout on the treadmill for a obese person? When you are overweight, you will likely have difficulty with stamina so it would be best to just walk. You need not jog or run. Walking on the treadmill would be a solid way to get started with the treadmill. As your stamina increases, you can workout in a more challenging manner. 2. Is one hour per day on the treadmill a good workout? One hour per day is a tremendous workout. Even if you are just walking on the treadmill for any hour could burn upwards of 300 calories. Jogging on the treadmill would certainly burn even more. 3. How to workout on treadmill? There are several ways to workout on a treadmill. Many will workout with intervals. Others will modify the programs on the treadmill to run on inclines or to alter speeds. Really, there are scores of different exercises you can perform on the treadmill and they are all valuable. 4. How to get the most out of your treadmill workout? You will want to be consistent with your workouts. Don't miss them if at all possible. Try to push yourself a little and don't get too complacent or lax with your approach to working out. 5. What is the best treadmill workout to lose hips and thighs? You cannot spot reduce with a treadmill workout. You also do not have to. If you are working out on the treadmill consistently, you will burn a lot of calories and you will expand your potential to develop lean muscle mass. The hips and thighs will improve as part of the overall improvement package. 6. What level should you do on treadmill to get a good workout? This is really based on your own fitness level. Don't be too complacent with your treadmill workout. You never want to overdo it either. The key is to workout at a level you can handle while also seeking to maximize your gains. 7. What's a good workout on the treadmill for a 315 lb female? This would be a very difficult question to answer because the stamina of a person at such a weight would be highly in question. Also, one would have to be concerned with potential adverse health reactions. As such, it is wise for the female in question to speak with a qualified healthcare professional about what would be the best course of action to follow. This way, the treadmill workout will not have a tough time with it. 8. Will 4 workouts of each 15 minute on a treadmill as good as a solid hour? Not only would this be just as good of a workout, it could even be a better workout program depending upon what you do with the 15 minute sessions. Also, some may not have the stamina to perform a full one hour workout. They may not have a full hour to workout with at one stretch. In both instances, you could employ 4 workouts of 15 minutes a day to attain results. 9. Can treadmill exercise get rid of belly fat? Yes, a treadmill workout can not only get rid of belly fat it can get rid of fat wherever it is deposited on the body. 10. 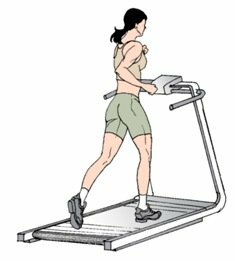 Is walking on a treadmill good exercise for a pear shape body? Yes, any body type can gain great benefit from working out on a treadmill. 11. Is exercise bike better than treadmill? There is a bit of controversy with this because both have their fans and their detractors. However, many experts will note that treadmills burn more calories and certainly can perform a greater variety of workouts. 12. How often should an 11 year old girl exercise on the treadmill? In all honesty, it might be best for an 11 girl not to workout on a treadmill since the body is still developing. 13. Is walking on a treadmill good exercise for pear shaped bodies? Go from Treadmill Workouts to Weight Training Homepage.